The fine design of the 14k white gold body on this engagement ring features two 4.1mm peridot rings linking together as the white gold body features two lines that are not directly aligned. This is symbolic of how your best days with your loved one are yet to come. 19 diamond accents at 0.19 carats are included too. 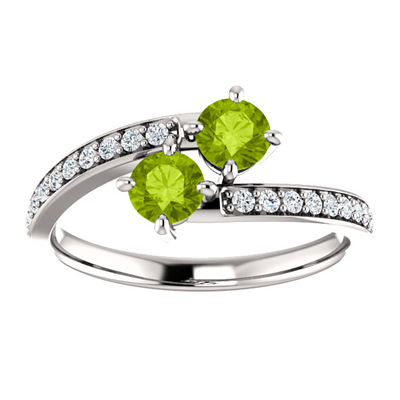 We guarantee our 14k White Gold Two Stone Peridot Ring with Diamond Accents to be high quality, authentic jewelry, as described above.